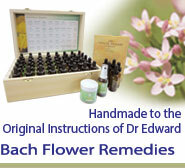 Our Bach Flower Remedies are handmade according to the original instructions of Dr Edward Bach. We offer all 38 Bach Flower Remedies, Revival Remedy and Revival cream & spray, plus complete Bach sets and personalised Bach combinations. The Bach Flower Remedies are a wonderful set of remedies that can help you to achieve greater balance & harmony in your life in a simple, natural & effective way.